This is a lawsuit brought by former owners of a car who were incorrectly identified as the driver of the vehicle (and his father, respectively) who ploughed into a crowd of pedestrians in Charlottesville. In the wake of the planned alt-right demonstrations, a gray 2010 Dodge Challenger drove into a crowd of pedestrians and killed Heather Heyer. Several posters and a news organization (GotNews, of Chuck Johnson fame) wrongly identified Joel Vangheluwe as the driver-perpetrator. The grey Challenger was owned at one point by Jerome Vangheluwe, Joel’s dad. The car was actually driven by Alex Fields, Jr., who acquired the car that the Vangheluwes once owned. According to the court, while the Vangheluwe family was in the midst of hosting a wedding celebration, pandemonium broke out as a result of social media posts identifying Joel as the perpetrator. The Vangheluwes received a torrent of online threats and messages at their home. They feared for their safety. They sued twenty individuals and two news entities in federal court in Michigan. when a defendant [doxxes a plaintiff], does the [doxxing] amount to constitutionally minimum contact with the state where plaintiff resides? The plaintiffs sought to rely on the Calder “Effects” test, where the Supreme Court said that a defamatory statement about a plaintiff could reasonably have effects in the plaintiff’s home state and would support jurisdiction against an out-of-state defendant there. However, the court notes that in Calder, the defendants had additional contacts with California beyond merely posting the articles about a California resident. The court concludes that merely publishing a defamatory article about an in-state plaintiff is not by itself sufficient to confer jurisdiction. There must be something more. The court applies this rule and comes to the following conclusions as to the moving defendants. A defendant who tweeted “killer confirmed,” referencing Joel, was subject to jurisdiction in Michigan because the poster actually included Joel’s home address. This defendant said that the post did not receive much attention online (no likes, no retweets and 4 comments, 2 of which took issue with the post). She says she was not aware of any Michigan followers and had never visited Michigan or communicated with anyone from there. But the court says that given the “relatively slight” jurisdictional burden plaintiffs face, plaintiffs met it. Interestingly, the court takes care to say that this defendant’s conduct amounted to doxxing (the court looks to the format of the post and compares with other posts during this time-frame and concludes that the poster intended to reveal Joel’s address online). The court found personal jurisdiction proper. The court said two other defendants are not subject to personal jurisdiction in Michigan. One of them (Nehlen) merely tweeted a GotNews article. The article itself did not disclose Joel’s address (and plaintiffs allege the article is more defamatory than doxxing). The court says “there was nothing ‘Michigan’ about Nehlen’s tweet.” The plaintiffs tried to marshal additional facts, such as that Nehlen was running for a seat in the House of Representatives and tweeted the message to his supporters in Michigan, but Michigan stood sixth on the list of states where his supporters lived. The court is not sold. Another defendant (Weikart) tweeted Joel’s name, that Joel was from Romeo, Michigan, and the make and license plate of the car. The court says this is like Calder except it lacks that something more. The court dismisses this defendant on jurisdictional grounds. GotNews’ Anti-SLAPP Motion: GotNews filed an anti-SLAPP motion. 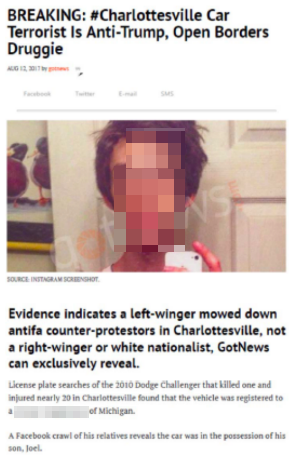 GotNews identified Joel as the perpetrator and as an “Anti-Trump, Open Borders Druggie.” The article included screenshots from various social media posts of Joel. The court first looks at whether the anti-SLAPP motion can be applied in federal court because it conflicts with the federal rules. The court says it will treat GotNews’ filing as one for early summary judgment under rule 56. GotNews pointed to various accurate statements in its article and says Joel cannot establish falsity, but the court rejects this argument. Any “reasonable reader” would look at the article and conclude GotNews falsely asserted Joel drove into the crowd of pedestrians. GotNews argues, given its reliance on the 4Chan board and public records, no reasonably jury could think it published with reckless disregard for truth . . .
Am I reading that right? Did someone actually argue that they were reasonable in presenting something they found on 4Chan as fact? Indeed, the court is not persuaded by reliance on 4Chan. In the context of dealing with the “wire service” privilege, the court says it is “not convinced that 4Chan is a reputable news-gathering agency.” Not surprisingly, plaintiffs are able to present a plethora of evidence on the freewheeling nature of 4Chan. The court also says GotNews is not entitled to dismissal of Joel’s intentional infliction of emotional distress and false light claims. We’ve seen several tort lawsuits involving (often organized, mob-based) online torts, and they all seem to throw off interesting rulings. Gersh v. Anglin is one in this genre. The Eichenwald seizure lawsuit vaguely fits in this category. Several plaintiffs allegedly injured (physically) by the “Unite the Right” organizers also brought suit in Virginia. Shortly after the attack, users of a 4Chan.org forum (the “/pol/” or “Politically Incorrect” forum, to be specific) were able to track down the vehicle identification number for the Dodge Challenger. And a 4Chan user had run the VIN through SearchQuarry.com. (According to its website, SearchQuarry allows its users “to search for many different kinds of public records including but not limited to criminal records, vehicle records, civil records, court records, driving records, . . . .”) The 4Chan user posted a screenshot of the SearchQuarry results; the screenshot stated in part, “Owner Name: Joel Vangheluwe.” A reporter for Defendant GotNews, LLC saw this screenshot on the 4Chan message board or otherwise learned of it. And with the name Jerome Vangheluwe in hand, the GotNews reporter located the social media pages of Jerome’s then 20-year old son, Joel Vangheluwe. It seems like yesterday that bloggers were hungrily sleuthing about the fonts and formatting of the so-called “Killian Memos” that led to a black eye for CBS and Dan Rather. Those feel like innocent times! This not the first time the term “doxing” has appeared in a court opinion. A search for “doxing” and “doxxing” both revealed a handful of results. Interestingly, plaintiffs did not assert a claim for invasion of privacy but stuck with defamation, intentional infliction of emotional distress, and false light. As part of the jurisdictional argument, the court takes care to conclude some of the posts are actually “doxxing”. This seems relevant to the court’s analysis. Although the court doesn’t explain why, it seems that in the case of doxxing, the tortious act actually involves the location of the plaintiff. It also gets at the fuzzy nature of “doxxing” – is there a difference between merely posting someone’s information (such as part of a directory) and posting with the intent to draw attention to the address and draw people there? Interestingly, there’s not a ton of discussion about whether GotNews satisfied any particular standard of care. The court notes that because this is a private-figure plaintiff, the actual-malice standard does not apply (under a Michigan Supreme Court case). GotNews actually ended up arguing it was non-negligent, but the court says that’s a jury question. Eric’s Comment: This is a “fake news” case. Though the court system is a cumbersome way of correcting fake news, the law still plays a critical and integral role in managing the information ecosystem. Thus, it’s unquestionably wrong for anyone to claim that fake news can be disseminated online without any legal consequence. Case citation: Vangheluwe v. GotNews, LLC, 2019 U.S. Dist Lexis 18700 & 18705 (E.D. Mich. Feb. 6, 2019) (two different rulings). The jurisdiction ruling. The denial of the motion to dismiss.